For almost 30 years, the Israel Film Festival in Los Angeles has presented over 900 feature films, documentaries, television dramas and short films to nearly a million filmgoers and brought hundreds of Israeli filmmakers to the U.S. to share their art. Starting October 28th, the Israel Film Festival will screen 29 narrative and documentary films, including three 2016 Oscar contenders, 10 World Premieres, 7 US Premieres and 7 Los Angeles Premieres - many of which have already won awards in Israel and at other festivals. In addition, Dr. Sharon S. Nazarian will be honored with this year's IFF Humanitarian Award, Helen Mirren will be honored with the 2015 IFF Career Achievement Award and Aaron Sorkin will receive the 2015 IFF Achievement in Film & Television Award at the Opening Night Gala taking place this Wednesday, October 28th at the Steve Tisch Cinema Center at the Saban Theatre in Beverly Hills. 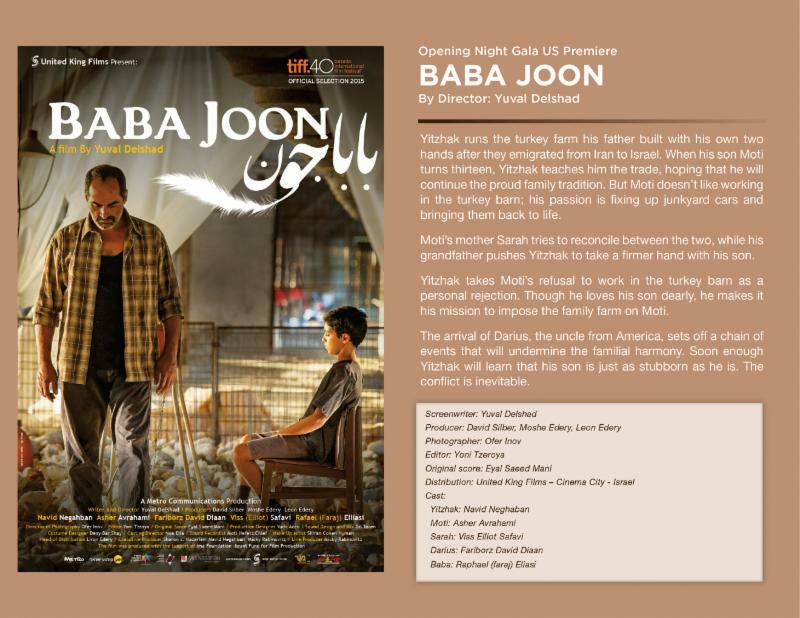 Among this year's highlights are Baba Joon, Israel's entry to the 2016 Academy Awards for Best Foreign Language Film and winner of the Israel Academy Ophir Award for Best Picture. Meir Fenigstein, the Israel Film Festival's director and founder told me that, "the Festival has truly become one of Hollywood's very first stopping points during the Academy Award campaign season to showcase Oscar contenders, as witnessed by the participation of Helen Mirren, Aaron Sorkin and Baba Joon this year." For more information, please visit www.IsraelFilmFestival.com.